Ever since the original Surface and Surface Pro models were introduced, users have been able to refresh their installations or reinstall the OS using the device’s recovery image, which is stored by default as a separate partition on its primary (SSD) drive. This enables easy repair or recovery for any Surface that can still access that drive without having to locate and use a matching external recovery disk. Nevertheless, MS recommends that users or admins create such a drive using the “Create a recovery drive” facility provided as part of the Windows 8/8.1 runtime environment (and carried forward in the Windows 10 Technical Preview, as a similar desktop search on my test installations just verified). Here’s what the Disk Management utility on my SP3 shows after running that utility on a UFD of suitable size (that utility says it should be “8 GB or greater” but MS recommends 16 GB or greater on its “Download a recovery image for your Surface” page for SP3 models). 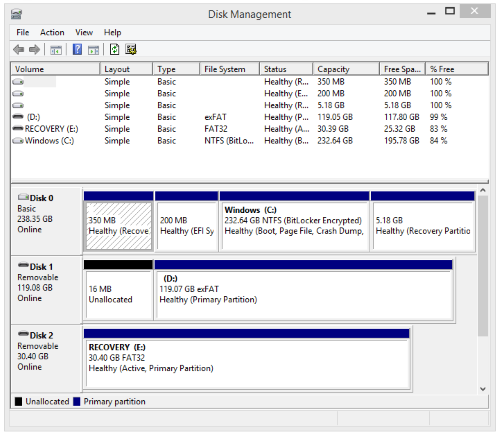 Although MS recommends 16 GB for the UFD to hold the recovery partition, actual space consumed is under 6 GB using the local recovery utility, and . Last week, MS made download images available for all of its Surface Models (RT and Pro models in the 1, 2, and 3 series) at the afore-linked download page, to address those situations where recovery may be needed and the primary drive on the Surface in question may not be available (and no external recovery drive has been created in advance). The process requires Surface owners to enter a valid serial number for each such download, but can be conducted and completed on another PC — I did it on my primary production desktop last night, for example — including the creation of the recovery drive on a UFD of suitable size once that download is complete. It comes in the form of a ZIP file that is 6.18 GB in size and 6.24 GB when its contents are extracted and copied to a target drive. Warning: this tool only enables restoration or recovery of a “factory-fresh” Windows image. That means you’ll lose all of the applications you’ve installed since firing up your Surface for the first time. That’s why I prefer the Slimware Utilities RecImgManager utility: it captures a current snapshot for the “Refresh your system” operation that includes all the elements you’ve added to (or tweaked within) your system. Using this tool is a two-step operation, though: you’ll still have to run the basic refresh or recovery operation through Windows 8 or 8.1 using the recovery drive described here, then install RecImgManager and refresh to that image. This latter item must come from an external USB drive, alas, which necessitates working in the Surface Pro dock or using a USB 3 hub to accommodate both the recovery UFD and the drive with the RecImgManager refresh image, to get all the way back to where you want to be. But this “two-step” is still faster than installing a typical collection of applications on most workaday machines, though — Secunia PSI counts 52 on my Surface Pro 3, including a MS Office, a typical collection of third-party Web browsers, plus miscellaneous tools and utilities. In my experience bringing back the runtime environment takes longer to install than the underlying OS, usually by a significant margin.